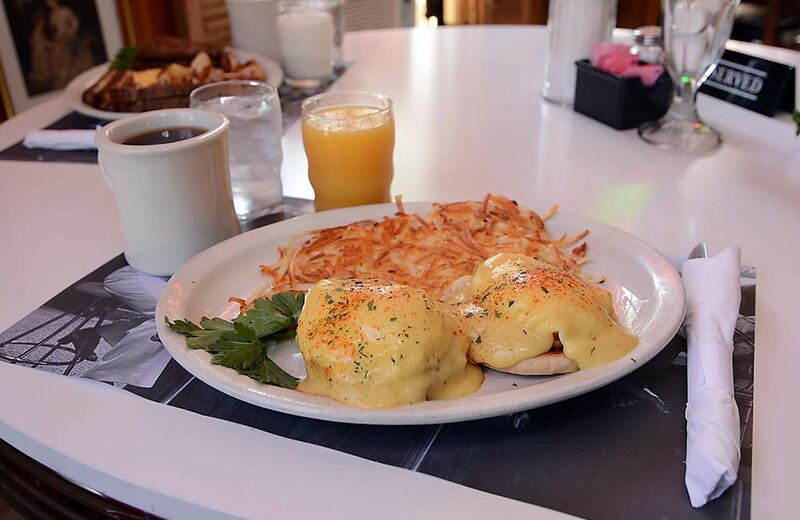 Toasted English Muffin, Canadian Bacon, & Perfectly Poached Eggs topped with Hollandaise Sauce. Served with American Fries or Hashbrowns. Baking Soda Biscuits smothered with our Homemade Sausage Gravy and served with 2 Eggs any style. 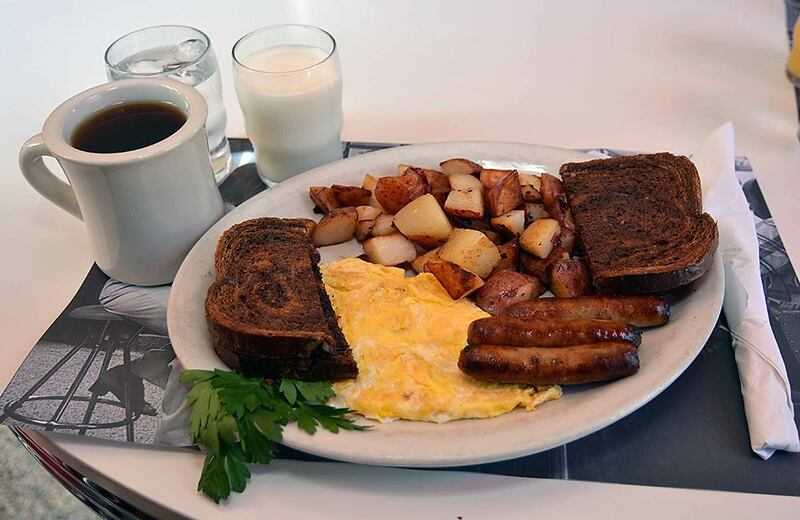 2 Eggs any style, Sausage or Bacon, American Fries or Hashbrowns, & Choice of Toast. Sub Broiled Whitefish for your Meat $3.50. American Fries loaded with Sautéed Onions, Mushrooms, Tomatoes, Sausage, & Cheddar Cheese. 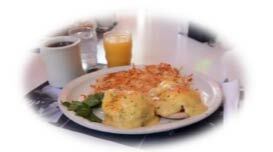 Served with Scrambled Eggs and an English Muffin. Ask your server about today’s fruit! Stuffed with Sweetened Cream Cheese & Seasonal Berries and Served with Sausage or Bacon. Topped with Whipped Cream and Served with Sausage or Bacon. Served with plenty of Butter & Syrup and Sausage or Bacon. Old Fashioned Oats served with Brown Sugar, Raisins, Milk, & Choice of Toast. Notice: Consuming raw or undercooked foods may result in foodborne illness. Sautéed Veggies & Cheddar Cheese served with Choice of Toast. 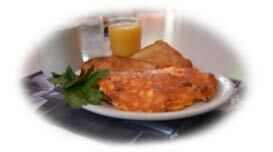 An omelet with loads of smoked ham & cheddar cheese served with Choice of Toast. 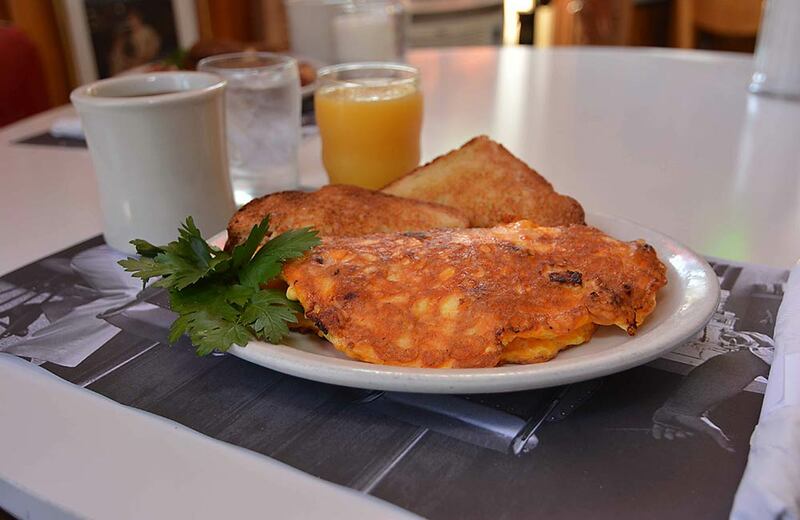 An omelet with plenty of melted cheddar cheese served with Choice of Toast. The first, and still the best in Bayfield. Choose Deep Fried or Sautéed with Peppers & Onions. 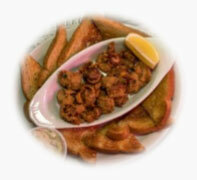 Served with Toast Points & Homemade Tartar Sauce for dipping. Cheesy Spinach & Artichoke Dip served warm with Fresh Celery and Carrot Sticks, & Toasted French Bread. Lightly Breaded and Deep Fried Lake Superior Whitefish Cakes served with Homemade Cranberry Tartar Sauce. Lightly Breaded Wisconsin Cheddar Cheese Curds served with Homemade Marinara or Ranch Dipping sauce. All Burgers, Sandwiches, & Wraps are served with Tortilla Chips and a Pickle. Add Soup, French Fries, or Sweet Potato Fries & Homemade Cole Slaw for $2.50. 1/3 lb. Angus Beef Patty or Grilled Chicken Breast served on a Toasted Kaiser Roll with Lettuce, Tomato, Red Onion, & Roasted Garlic Mayo. Sub Portabella Mushroom for the Meat $3.00. Add Cheddar, Swiss, Provolone, Feta, or Bleu Cheese $1.00. Add Sautéed Mushrooms or Fried Onion $0.75. Add a Fried Egg $0.75. Add Applewood Smoked Bacon $1.50. Thinly Sliced Corned Beef, Swiss Cheese, & Sauerkraut on Toasted Marble Rye. Homemade Reuben Sauce served on the side. Deep Fried or Broiled Lake Superior Whitefish served on a Toasted Ciabatta Roll with Applewood Smoked Bacon, Mixed Greens, Tomato, Red Onion, & Homemade Tartar Sauce. Generous amounts of Herb Roasted Turkey Breast, Smoked Ham, Applewood Smoked Bacon, Romaine Lettuce, Tomato, & Mayo wrapped in a Whole Wheat Tortilla or on Whole Wheat Toast. Herb Roasted Turkey Breast, Homemade Mashed Potatoes and Stuffing, Turkey Gravy, Toasted Pecans, & Dried Cranberries wrapped in a Whole Wheat Tortilla. Smoked Lake Superior Trout served on a bed of Mixed Greens with Tomato, Red Onion, Toasted Pine Nuts, & Feta Cheese Crumbles. Served with a side of Homemade Lemon-Dill Vinaigrette. Mixed Greens with Tomato, Red Onion, Cucumber, Sliced Portabella Mushroom, Bell Pepper, Shredded Cheddar Cheese, & Croutons served with your choice of Homemade Dressing. Add Broiled Cajun Whitefish $5.00. Add Smoked Lake Trout $6.00. Chopped Romaine Lettuce, Tomato, Shredded Parmesan Cheese, Homemade Croutons, & Caesar Dressing. Add Chicken Breast $3.50. Mixed Greens, Tomato, Cucumber, Red Onion, Shredded Cheddar Cheese, & Croutons served with your Choice of Homemade Dressing. Ask your server about today’s selection! *Specialty Soups may have a minimal upcharge. Make it SUPREME! Add Shredded Cheddar Cheese, Pico de Gallo, Sour Cream & Tortilla Chips for $1.95. 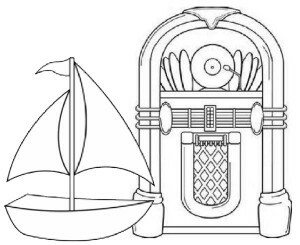 Broiled or Deep Fried Fresh Lake Superior Fish served with Homemade French Fries, Sweet Potato Fries, Mashed Potatoes, or Baked Potato, Homemade Cole Slaw, Fresh Lemon, & Homemade Tartar Sauce. Homemade Meatloaf with Mashed Potatoes and Stuffing topped with Gravy & served with Homemade Cole Slaw. Oven-Roasted Turkey Breast served with Homemade Mashed Potatoes and Stuffing topped with Turkey Gravy, & served with Homemade Cole Slaw. 2 Pieces of Broasted Chicken served with Homemade French Fries, Sweet Potato Fries, Mashed Potatoes, or Baked Potato, & Homemade Cole Slaw. No meal at Greunke’s would be complete without a slice of Debby’s Homemade Pie, a Hand-dipped Shake, Malt, Sundae, Float, or Homemade Shortcake (seasonal). Ask your server about the today’s delectable choices! We offer 6 different beer selections on tap for your refreshment. Ask your server about today’s ice cold pints! We also offer a fine selection of red and white wines! Dinner Entrées are served with Choice of Pan Fried Baby Red Potatoes, Roasted Garlic Mashed Potatoes, Baked Potato, or Rice Pilaf & Vegetable. Add a cup of Homemade Soup, a Side Salad, or Side Caesar Salad for $1.95. Broiled or Deep Fried Fresh Lake Superior Whitefish served with Fresh Lemon Wedge & Homemade Tartar Sauce. Fresh Lake Superior Trout served with Fresh Lemon & Homemade Tartar Sauce. We offer 6 different beer selections on tap for your refreshment. Ask your server about today’s ice cold pints! We also offer a fine selection of red and white wines! Please refer to our wine list. Add a cup of Homemade Soup, a Side Salad, or Side Caesar Salad for $1.95. USDA Choice Char-Grilled Beef Filet served on Texas Toast with Homemade Fries & Cole Slaw. 4 Pieces of Broasted Chicken served with Choice of Starch, Vegetable, & Homemade Cole Slaw. Homemade Herb Pesto & Toasted Pine Nuts tossed with Linguine Pasta and topped with Grilled Portabella Mushroom & Parmesan Cheese. Served with Toasted French Bread. Add 3 Jumbo Black Tiger Shrimp $7.00. Sautéed Bell Peppers, Red Onion, Tomato, Portabella Mushroom, and Homemade Marinara tossed with Linguine Pasta and topped with Parmesan Cheese and Fresh Parsley. Served with Toasted French Bread. Homemade Marinara tossed with Linguine, topped with Parmesan & Mozzarella Cheeses and Fresh Parsley. Served with Toasted French Bread. 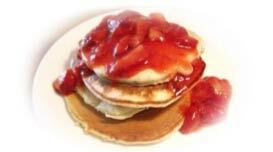 * Fruit Pancakes are a seasonal item made with Fresh Local Berries. Please ask your server about availability. All Kid’s Lunch & Dinner items are served with a Choice of Homemade French Fries, a Cup of Soup, Or Fresh Veggies with Ranch Dip.